A few weeks ago I published an informative guest post by Amanda Williams all about Sustainable Tourism. I particularly enjoyed the post because while it’s easy to bandy about the term ‘sustainable,’ very few people actually understand what it means to practice sustainable travel. I know I didn’t truly understand all the implications. After a recent trip to Alberta, Canada though two of the tenets of sustainable tourism really hit home, economic and socio-cultural sustainability. In her post, Amanda defines economic sustainability as “building linkages and reducing leakages – essentially, keeping the money local.” She goes on to call the money aspect the most important in creating a truly sustainable travel experience. Socio-cultural is defined as “minimizing negative impacts [of tourism] and focusing on more positive ones, such as promoting cultural exchange and preserving local traditions.” While I understood the definitions and the rationale behind both, recent experiences really proved to me the importance of these legs of the sustainable travel stool. While traveling through the Banff/Lake Louise region, I was fortunate enough to experience some of the activities that make the area great. Hot springs, snow tubing and exploring nature were all highlights, but one of my favorite activities was dogsledding with Kingmik Dogsled Tours. I’ll fully detail my experience with them in a future post, but I first want to share what I learned from the experience. Megan is a seasoned vet of some of Canada’s most inhospitable areas. She’s explored the Northwest Territories, the Yukon and spots on the map that will probably never have a name. All of this has been done in the harshest of winter weather conditions and all in the name of training with her dogsled team, her true love in life. 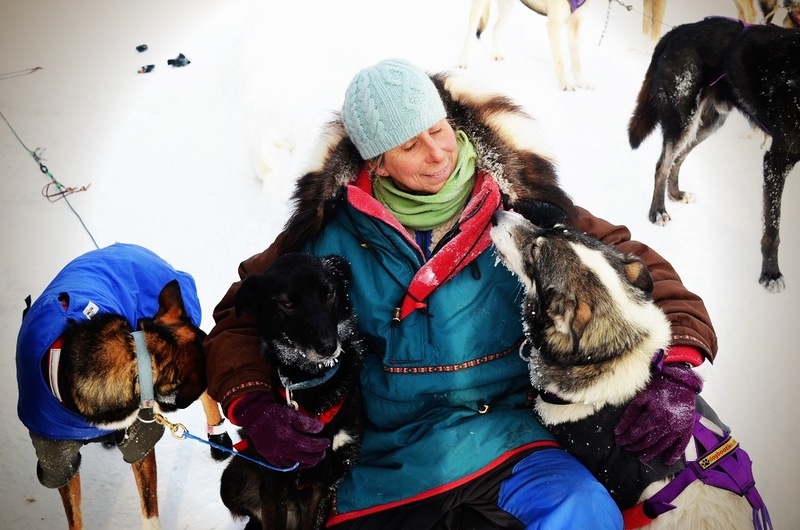 Megan is also the owner of Kingmik Dogsled Tours, a business she took over several years ago and has been growing ever since. Kingmik has a long history in the region and was the first to offer world class dogsled tours around the Lake Louise area. The tours have always been popular, and with good reason. The experience was an exhilarating one that I shall never forget. But since the economic downturn business has been down, as it has for most companies, and Megan is a little worried. What amazed me is that this was just one 2-hour excursion with one company. But if you multiply that across the span of a typical vacation, then multiple that by the number of visitors, you can quickly see how many times people are confronted with the decision to support something that helps both the economic and societal sustainability of the region, or not. We can’t always make the right choices, we’re not perfect. But a little research and a little determination to really help local communities when we travel can and does make a huge impact on people’s lives. It helps people like Megan whose love in life is racing with her pups and maintaining a way of life that has defined the rugged determination of Canadians for more than a century. What do you think? Do you try to patronize local businesses when you travel or is it not a concern? This is the point I was trying to make in my comment about your review of Dreams Resorts – as Amanda points out “A hotel or company owned and operated by a foreigner is not likely to contribute much to the local economy – the money will likely leak overseas instead. This is not sustainable.” I would always try to avoid all-inclusive resorts and foreign-owned hotels if possible – you should ensure your tourist dollar benefits the locals, not a foreign corporation. Inclusive resorts are even worse as they discourage visitors from straying outside the compound to buy anything from the people whose country they are visiting. When I’m traveling I’m their to experience the ‘local’. I want to eat local food, drink local beverages, find the local secrets, experience their culture and meet their people. What’s the point of travel if you’re not going to interact with the locals? It was refreshing to read this post. From the point of view as a backpacker or budget traveler, I think this perspective is often not thought of at all… too busy saving nickels and dimes. I think that no matter what anyone’s budget is, supporting local economies is important. It’s really nice that people can save money by hand washing their clothes, but it doesn’t break the budget to bring it to a locally-owned laundry service (as just one example). Thanks for the good read. Interesting observation that I hadn’t considered, is this dependent on a certain financial flexibility. This is a perfect example of spending your money on a locally-owned-and-operated business, and a good example of the fears that these sorts of businesses face in a down economy. I certainly do try to patronize local businesses and companies as much as I can when I travel. And, if I can’t, I do my best to get a taste of local life and traditions in other ways. I think it’s really important to do. I always try to patronize local businesses when traveling. In addition to helping the community, I think it usually gives ME a better experience. Prices tend to be cheaper and you get more knowledge of the people, the culture, and what to do in the area. Your pointers and observations are completely in line with the values underlying a nearly two-year-old effort I’m part of called the Local Travel Movement at http://www.localtravelmovement.com. The Local Travel Movement is not-for-profit platform started by people from companies founded on a passion for Local Travel and commitment to Local Travel values. It is there primarily to champion Local Travel, but also to regroup Local Travel operators that support Local Travel values and would no doubt support the planning tips you have shared. In keeping with our mission, with your consent we will be republishing part of this post there, pointing back to the original here. Supporting a small local business is a win-win… it sounds like you had an amazing experience and one that was a bit off the beaten path. This scenery reminds me of the movie The Grey! Yeah, it was a great time and the scenery was spectacular! Supporting local businesses is not only the *right* thing to do, more often than not, it’s where you will find the best value, advice, and travel experiences. So pleased to read this post of yours, Matt. Local travel and slow and sustainable travel (because they’re all linked in my mind) is partly what our ongoing Grantourismo project is all about. (The other parts are experiential travel and ‘giving back’, but again, they’re all connected – what we like to call ‘meaningful travel’). With every single travel decision we make my husband and I ask ourselves “is this sustainable?” – whether it’s a tour company, hotel, restaurant, you name it. Is it locally owned (preferably) and if it’s not how is it giving back to the community? Because many good businesses, in places like Cambodia and Laos for instance, are owned or part owned by foreigners, but they’re providing employment and training where there wouldn’t be any, and perhaps they’re going further, say, to save a dying traditional craft. In those cases I’ll look for Fair Trade certification. Once you start to think sustainably, it becomes second nature. It’s no great effort and yet it can have an enormous impact. Fascinating article, Matt. Reminds me of a dog sled tour I did in Kiruna, Sweden years back. Off-the-beaten-path and allowed me to learn amazing local traditions with the people. And when you see how your travel money is spent on helping communities make a living out of some amazing things they are doing to preserve a culture, it’s even better!